The last ship to enter service for the Union Steam Ship Co. before the merger which created Union-Castle in March 1900, Galeka was built by Harland & Wolff, Belfast. She was delivered in December 1899 and entered service early the next year. 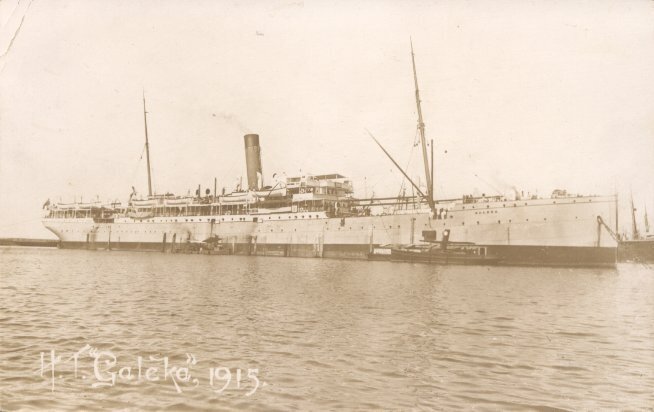 Galeka served on Castle's, and then Union-Castle's intermediate service to South Africa until World War I. She was then requisitioned by the Admiralty, utilized for a time as a troop transport, and refitted as a hospital ship with accommodations for 366 passengers. On 28 October 1916, entering Le Havre without patients on board, H.M.H.S. Galeka struck a mine. 19 Royal Army Medical Corps personnel died as a result. She was beached at Cap la Hogue, but was a total loss, Union-Castle's first war casualty.